Healthy Vision in the Blink of an Eye! How has Vizu-All Plus helped others? What does Vizu-All Plus contain? How do I use Vizu-All Plus? How long does a bottle of Vizu-All Plus last? Think of the eye as a camera. A camera needs a clean lens and a film to produce an image. In the same way, the eyeball needs a lens (cornea, crystalline lens, vitreous) to refract, or focus the light and a film (retina) on which to focus the rays. If any one or more of these components is not functioning correctly, the result is a poor picture. Similarly, if inter-ocular pressure is too great, or circulation is poor, the image is affected. Capillaries bring oxygen rich blood to the optic nerve and the eyeball (like the batteries in your digital camera!) The retina represents the film in our camera. It captures the image and sends it to the brain to be developed. The macula is the highly sensitive area of the retina and is responsible for our critical focusing vision. It is the part of the retina most used while reading or staring at an object. Eye hygiene is essential and it is a good idea to keep contact lenses in sterile fluid when not in use. Always wear sunglasses when the outside glare is too bright, and refrain from watching television in poorly lit areas. Never read in darkened rooms. Eye products should not be shared and cosmetics such as eyeliners, mascaras and eye pencils should be thrown away when they are past their expiry date. Natural and home remedies for healthy eyes have been used in traditional medicine for thousands of years to support good circulation and the sensory system, helping to maintain healthy and efficient visual health. There are now many published clinical studies demonstrating the ability of natural remedies to support the eye and its surrounding structures. Home remedies for healthy eyes most popularly feature organic teas and cucumber and potato slices to relieve puffiness. In more recent times, research has confirmed this traditional wisdom. Eye supplements typically include good for the eye vitamins such as Vitamin C, E, B2, and the minerals Zinc and Selenium. New eye supplements are now including Lutein. Vizu-All Plus contains carefully selected herbs to promote healthy eye functioning and to guard against eye disorders such as cataracts, macular degeneration and visual problems associated with diabetes. Vizu-All Plus contains the following herbs in therapeutic dosage, especially selected for their effectiveness in the natural prevention and treatment of diabetic retinopathy, glaucoma, cataracts and macular degeneration. Vaccinium myrtillus (Bilberry) is the principal ingredient in Vizu-All Plus and has an impressive history in the natural treatment of eye disorders. It is routinely recommended in Europe as an addition to conventional medical treatment, particularly for eye disorders. Medically active components of bilberry include flavonoid compounds known as anthocyanosides, which work to counteract cell damage caused by free radicals. By strengthening the tiny blood vessels of the eye, bilberry helps to facilitate delivery of essential oxygen and nutrients to the eye and has been shown to be effective in the prevention and treatment of degenerative diseases of the retina. It also reduces the incidence of haemorrhage in the eye, often associated with diabetes. Further studies have demonstrated the effectiveness of bilberry in treating and preventing cataracts and glaucoma - two very common eye disorders in older people. Because of this, it is recommended that all people over the age of 50 take Vizu-All Plus daily to prevent eye disorders and promote optimal visual health. Aspalathus linearis (Rooibos) is found only on the slopes of the Cedarberg mountains in the Western Cape of South Africa and has been used medicinally for thousands of years by the indigenous people of that area. It is used as an effective all round tonic and restorative, to reduce digestive complaints, improve liver functioning and balance blood sugar levels. Like bilberry, Rooibos also has powerful anti-oxidant properties, mainly due to its supeoxide dismutase (SOD) mimetic properties. SOD is an enzyme in the body which is especially designed to neutralize unstable oxygen molecules (free radicals) as soon as they occur and can therefore help to prevent a broad spectrum of diseases. Due to its high mineral content, Rooibos is also instrumental in the maintenance of healthy metabolism, bones, skin and teeth. Rooibos can help to control blood sugar levels, lower blood pressure and enhance immune functioning. It is an extremely nutritious herb, containing Vitamin C, Alphahydroxy Acid, potassium, copper, magnesium, calcium, iron, zinc, manganese and fluoride. Vizu-All Plus is taken internally and comes in convenient, concentrated and easily absorbable tincture form which can be conveniently diluted in a little juice or water. Adults - Dilute 15 drops in a little juice or water and drink three times a day. Children under 15 years - Dilute one drop per year of age of the child in a little juice or water three times a day. Due to the fast absorption into the body by means of a tincture formula, results are literally ‘seen’ within 24-48 hours! Over time (usually 3-6 weeks) Vizu-All Plus will continue to act in a supportive capacity while supporting visual health and vitality in the eye, with some individuals responding sooner than others. Best results are achieved when Vizu-All Plus is used consistently and the recommendations regarding eye hygiene are followed. 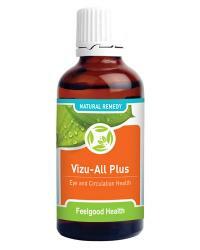 One bottle of Vizu-All Plus will last approximately 30 days depending on usage. Bright Eyes Combo: Soothe itchy, gummy eyes and support eye health long term! Soothing eye wash plus long term vision health remedy! Sweet Sight: Our remedy for Diabetic support plus vision health tonic!